Don’t have an affiliate account yet? Want to make more money from your photography blog? Making a 30% commission on sales of our e-books, plugins and digital training programs is easy with the Shutter Muse affiliate program. If you like our products and think that your readers might like them as well then sign up now and with just a few clicks you can be making a little extra money each month. It doesn’t cost you a penny to sign up and your readers, fans and customers receive the same great prices on our products that they always have done. All we do is reward you every month* for helping us spread the word about Shutter Muse and what we are doing. If people were to click through to Shutter Muse from your website using your affiliate link and they all spent a combined total of $2000 in one month, we will send you $600 at the beginning of the next month. Simple! Have more questions? Take a look at out affiliate program FAQ below. This is the main dashboard where you can create your links, track your clicks and grab banners and images about our products. If you feel there is something else that you need but can’t find, or you need a review copy of a product, please contact us we will get something created for you. Please ensure that you are familiar with the Affiliate Agreement and abide by the rules. Remember, you don’t just have to use these links, you can append your affiliate tracking code to the end of ANY Shutter Muse URL, whether it’s a product from the store, a blog post or even an entry from the Photography Glossary. All of the posts and pages on the site contain links back to the store, so if someone reads an interesting blog post and then decides to buy a related product, you’ll get credit for that sale. 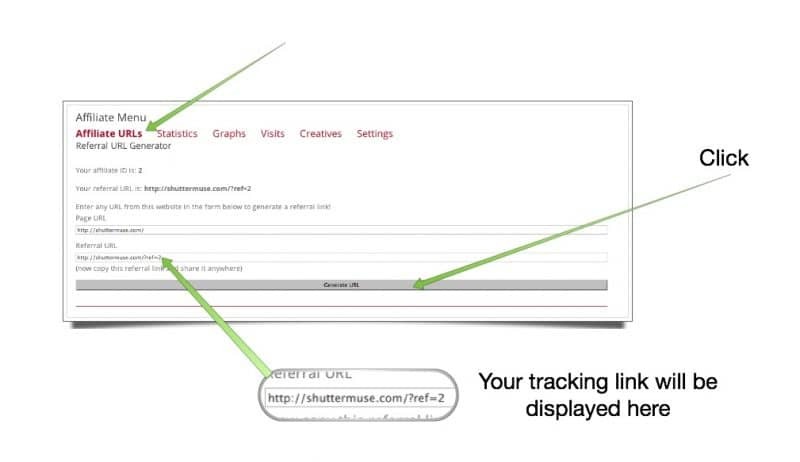 This means that your general affiliate link that you can always share with people for the Shutter Muse homepage is [affiliate_referral_url url=”https://shuttermuse.com”]. When a reader clicks that link, a cookie will be stored in their browser for 30 days to tell us that that visitor came from you. If they buy any digital products from our store in that timeframe, you’ll be credited with the sale and we’ll pay you a 30% commission. Within the affiliate dashboard there is also a URL generator that will turn any Shutter Muse URL into a trackable link with your unique reference in it. In the dashboard, click “Affiliate URLs” in the menu. Then paste the URL that you want into the box and hit the button. It will generate your tracking link and then you can copy and paste that link for adding to a blog post or sharing via social media with your followers. Thats it! It really is that simple! You can monitor your statistics in the dashboard as well and you should pay particular attention to spikes in your click throughs and sales when you create or share specific pieces of content. This will help you to figure out what kind of content your readers and fans respond best to. Once you have logged into the site on this affiliate dashboard page, you’ll notice a new link appears in the top menu bar of the site, giving you a quick way to return to the dashboard. This is only visible to logged in affiliates. If your login expires, or you manually log out, you’ll need to visit https://shuttermuse.com/affiliates to log in again, or click on the Affiliates button that is in the menu at the footer of the website. Banners are available under the “Creatives” option in the dashboard menu. New banners for upcoming e-books and seasonal promotions will be distributed prior to the launch of new books and special offers to allow you time to prepare content for launch dates. When new products are just around the corner we will provide you with cover graphics and sample pages in the case of e-books and sample image treatments and comparisons in the case of presets. If you need a specific banner size that’s not already available, please contact us and we’ll do our best to get something created. If you like one of our products as much as we think you will, don’t just tell people about it, write a review about it. Tell your readers why you think the product will help them and what they will get out of purchasing it, please don’t just copy & paste our press releases if you want the best results (and I know you do). Above all, when you are writing be enthusiastic and passionate about the product! Whenever you mention the name of the e-book or other product in your review, link that to your affiliate link. Once you have written your review make sure you post the link to your review wherever you can. Facebook, Twitter, Google+, Tumblr, Pintrest etc etc. Even try and get your friends to post the links as well if you can. Most people will hang out on your site and read some other posts as well so it’s a great way to drive up overall traffic on your blog. A week before we launch a new product we will send all of our affiliates the information about it. We will include sample pages, banners, cover graphics and everything else that you need to construct a great post about it. Take the time to pre-prepare a post and set it to post at the time and date we give you. There will be no point posting it earlier since the product won’t be live on our site yet so there’s nothing to be gained by jumping the gun (and we’ll ban you if you do it more than once,we’re nice people but we like folks that play by the rules:) ). Generating a buzz about a new e-book on the launch day will be the best way to boost your sales. Early sales of e-books are at the highest point because that is when we, and all the other affiliates, are shouting about it from every rooftop. If you want to maximize sales under your affiliate link then don’t delay in posting just in case one of your readers reads about it first on another site and uses their tracking link instead. Don’t be shy about writing about a product in multiple places or even multiple times. Not everyone will catch the content on your site every day so doubling up on your Shutter Muse content will reach a far wider audience and increase your sales. Note though that you should not simply copy and paste the exact same post that you did the first time, Google and it’s web SEO wizardry do not look kindly on that so make sure the content of both (or all!) your posts are unique and spread the posts out a few weeks apart. Heck you could even post one again a year or two later. Good photography advice is still good photography advice even if it’s a year old. If you make a second post then try to find a new angle on it. Perhaps the first post is a little more informational about the new product and the second post is a deeper discussion on what you have learned by reading it. Occasionally we will inform you of a new discount code or bundle sale. This kind of promotion works VERY well and gives a good bump in sales, plus a little money back in the readers pocket. Win win. Whilst it’s true that your 30% of the sale price is less than what you would make if the reader purchased the product at full price, you will make far more money by promoting the sales and coupon codes that we give out as overall sales numbers are much higher. If you’re looking for your own specific discount coupon for a special purpose then contact us to discuss. We are making no promises about this as we don’t plan to use coupons all the time, but if it was a special occasion for the right person we would consider it for a limited time. We’ll be creating all kinds of content here at Shutter Muse and not all of it will be simply e-books and training or workshops. Sharing our other content on your site gives you one more excuse to include your general referral URL link to Shutter Muse. Just add your code, [affiliate_ref] to the end of any URL for any post or feature article we share on the site. Your affiliate tracking is valid for 30 days so promoting some of our blog content will get previous readers of your site back to us and then we’ll convert them into customers for you. You’ll need to be inserting your affiliate link into these networks. Your general referral URL is [affiliate_referral_url] or you can simply add [affiliate_ref] to the end of any Shutter Muse link. If you forget how to do this there’s always the URL generator in the affiliate dashboard here. –>>Further Reading: How to automatically share our latest content with your affiliate link. Something to think about with Twitter is that people often follow many thousands of people relating to a topic that they like, in this case it would be photography. As the Tweets roll past there is no good way to look back through old tweets so most people have a tendency to just look though a few recent tweets when they pick up their phone or tablet. If you haven’t just recently tweeted then your tweet could easily go unseen. Don’t be afraid to tweet about the same subject two or three times in one day, just make sure you don’t use identical text and space the tweets out by a few hours. This also ensures that your followers in different time zones around the world stand a greater chance of catching your tweet! Make sure you are following us on Twitter as well so that you can include us in your tweet with @shuttermuse! I find that Facebook is becoming more and more visual by the month. The user interface has been updated recently to better display images and a post without an image will definitely receive less attention. Luckily Facebook does a pretty good job of pulling image from links that you post so you can simply post your affiliate link, but you might also want to grab an image from our product specific banner pages and post the actual image to your timeline with the hop link in the image description. Both methods work equally well on Facebook. Make sure that you ‘like’ our page first by heading HERE. Google+ is an emerging force and it is extremely popular with photographers due to the way in which images are given pride of place. As such, G+ is an extremely visual community. Making a post on Google+ without using an image has VERY little impact, even less so than on Facebook. People who use G+ are attuned to seeing big bold images trickling though their feed and a text only post just won’t cut it. Make sure that you also have us in your circle so that you can tag us in your post! We provide you with a selection of general Shutter Muse banners that you could also use here for the image, and we will also e-mail you with seasonal promotional banners from time to time. When new products come out, or when you just want to promote an existing product you can find cover graphics as well as page samples for every product at the bottom of the affiliate dashboard. All of these things would be great to use for catching peoples attention on social sites like Google +. Another good way to get more people passing through your affiliate link is to add a semi-permanent banner to your website or feed. The best banners to use for this are the general banners which are available HERE. From time to time we might also run seasonal promotions and these also work well, especially holiday banners when used from October to December. You will be informed via e-mail when specialty banners are available. The reason that I refer to these ones as semi-permanent is that they are usually put in areas that are more conducive to being left for weeks or even moths at a time. It’s important to note that banners on their own will not bring you riches! Direct linking within articles such as product reviews and new product announcements are many times more successful than banners on their own. Including other posts on your site about Shutter Muse products will remind people about us and in turn they are then more likely to click on the banner at a later date when they see it. Linking within articles AND banners are a great combo. Throw in some social media mentions and we’ll soon be making payments to you on a monthly basis. A wide range of banners are available on the affiliate banner page HERE. Simply select the size that works best for your intended location then copy + paste the html code that is supplied. If you need something that you don’t see, or you want something custom then contact us and we’ll do our best to help you. The sidebar of your blog is the absolute best spot since the banner will be visible on every page of your site. More views leads to more clicks and the more that click though the more money you will likely earn. If you are using wordpress then you can easily add a sidebar banner by clicking on Appearance in the Dashboard menu bar, then clicking Widgets and adding a Text Widget to your sidebar area. Then just grab the “copy & paste” code from the banner in the creatives gallery and paste this into the text widget. After the sidebar of your site, the next best place to put a banner is likely the footer if you have a widget area there, or by manually pasting it into the footer.php file of your WordPress theme. Did you know that you can also add banners to your RSS feed? Many people read sites these days via RSS and not by actually visiting the website. In those cases, the readers would not see the banners in your sidebar or footer. There’s an easy remedy to this if you use WordPress though as you can quickly install a plugin such as RSS Footer which allows you to paste a small section of HTML that will show up beneath every post in your RSS feed. I’ve used this very same plugin on some of my other sites to great effect. The hugely popular SEO plugin Yoast SEO also allows you to insert banners into your RSS feed. Similar to the idea behind the RSS Footer plugin, you can also install a plugin that will add content to the bottom of every blog post on your site. The WordPress plugin directory has many options that will do this, and it’s a quick way to add a banner to every page on your site if your WordPress theme doesn’t have this functionality built into it. As with all modifications to your website, proceed with caution, especially if you are unsure what you are doing. Make sure you have everything backed up. These plugin and modification suggestions should be treated as guidelines only and Shutter Muse will not be responsible for any problems caused with your website while trying to implement them. Here is a curated list of great articles that offer even more reading on the subject of successful affiliate marketing. A lot of what is mentioned is already covered here on our own page but it might drive it home even more if you read it from several sources! As a Shutter Muse affiliate, you can append your affiliate code to the end of any URL on the website, not just product pages in our store. Many of the posts and pages on the site feature ads and links back to related products in the store, so if you send someone to one of our blog posts, and they end up buying something in the store within 30 days, you’ll still get credit for that sale so it’s a great way for you to automatically grown your affiliate sales!